I love the start of football. Besides the start of fall, fantasy team drafts, buffalo chicken everything, and of course Sunday Funday all come to mind when football gets into gear. There wouldn't be a true Sunday Funday without cocktails...Am I right? For those early tailgating in preparation for those 1pm games, I've compiled a list of the best Bloody Mary options in the Charlotte area. 1. Tupelo Honey - With their "farm fresh" approach, Tupelo Honey focuses on creative menu options and the freshest ingredients. Their menus have a seasonal focus around the produce and their flavors. Their cocktail menu is just as creative, and their bloody mary options mark as my favorites in Charlotte. Yes, I said options. From their traditional Bloody Mary made with vodka to their "Moonswine Mary" that offers bacon, pimento cheese-stuffed olives, and a bacon salt rim, you'll be happy you stopped over in Southend. However, that's not even my favorite Tupelo Honey Bloody Mary. The Queen Mary is 20 ounces of "over the top" deliciousness, that even the most traditional Bloody Mary enjoyers can respect. 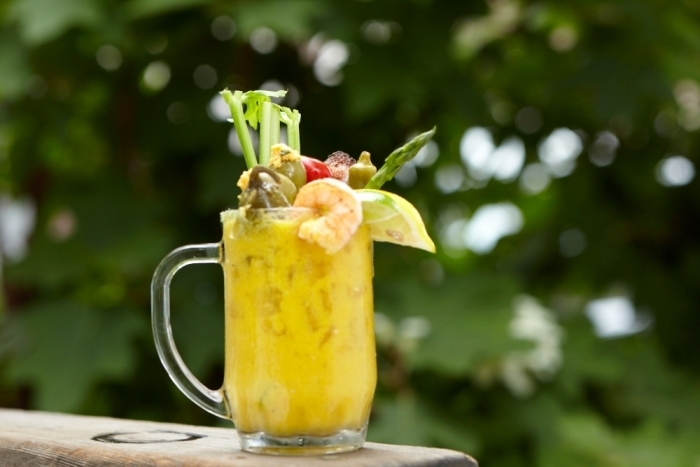 Made with roasted yellow tomatoes, moonshine, and a large array of tasty options (Maple Bacon, Pickled Jalapenos, Grilled Shrimp, etc), this cocktail is the Queen of Bloody Marys. 2. The Thirsy Beaver - This dive bar is your perfect neighborhood honkytonk bar. The crowd and bartenders are friendly. The jukebox is filled with tunes. The PBR tallboys is cheap. For those of you who haven't tried the Bloody Marys at The Thirsy Beaver...it's a hidden novelty that needs to be on your list. It's salty, it's vodka is heavily poured, and the hint of spice at the end makes you need the next sip. Sold. 3. Dandelion Market - For the Uptown crowd, Dandelion Market is the place to go when you want to dance the night away upstairs, and then recover heavily over brunch and their Bloody Mary bar. Their Bloody Mary bar is for those that want options. You want alot of bacon? You got it. Want to add gin instead of vodka? Go ahead, you crazy kid. 4. Tavern On the Tracks - If you want to watch Football and drink your Bloody Mary too, this bar is the place to be. TVs line surround the bar area, making the chances of your game being on very likely. Their food menu has alot of great sandwiches, wraps, and wings to accompany your salty beverage, and their drink menu keeps everyone happy. 5. Whiskey Warehouse - Ballin' on a Budget? Whiskey Warehouse is the place for you. With large TVs, a roofttop bar, and spacious seating, sit back and relax while you're watching football. On Sundays, they offer $2 Mimosas and $3 Bloody Mary bar. Your wallet can take a sigh of relief.